The Jefferson Educational Society is kicking off their 2015 initiative program, do you fit the bill? "This is a seven-month program that could change the rest of your life," says Michael Fuhrman. The program he's referencing is the newly minted Erie County Civic Leadership program – one of three initiatives of the recently established Jefferson Alliance for Community Progress. 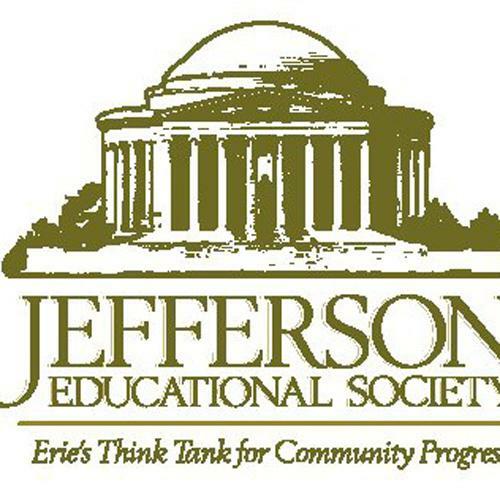 The Jefferson Alliance for Community Progress (JACP) – formed to be the leadership-in-action arm of the Jefferson Educational Society, Erie's nonprofit institution founded to promote civic enlightenment and community progress for the Erie Region through study, research and discussion – will tackle three 2015 JES initiatives: the Jefferson Dinner Series, The Jefferson Essays, and The Erie County Civic Leadership (ECCL) program. The Jefferson Dinner Series aims to foster cooperativeness in an effort to spark conversation about the challenges presented throughout the area. As Fuhrman puts it, the Dinner Series will work on "developing fellowship between four major regions in the area." The Jefferson Essays seek to bring back the dying art of the American essay with a quarterly publication of 25 to 35 page essays, focusing on local issues and opening avenues of dialogue (Think: Thomas Paine's Common Sense for Erie County as it is today). "We are fortunate to have productive leaders who have made a difference," says Fuhrman, the JACP's associate director. "We now need to create a new group of dedicated frontrunners who will provide the energy and direction for the next 20 years." And that's just what Erie needs. The old guard – after all – isn't getting any younger. While the development of Dinners and Essays is still underway, there will be an informational open house on Thursday, March 19 for Erie County Civic Leadership program at the Jefferson Educational Society, located at 3207 State St. In addition to Fuhrman, former Erie County Executive and the JACP director, Judy Lynch, will be there to speak about the program and address any questions those interested in applying may have. According to Fuhrman, the ECCL program will prepare young professionals looking to engage their community in a meaningful, impactful way to better both themselves and the community in which they live. The program will be broken up into two parts. The first part of the two-part, project-driven program will provide sessions to educate participants on the function of local government, and will feature an overnight retreat in Pittsburgh in April. The second part of the program then will focus on economic development, land use, public safety, and local politics, as well provide insight for running for elected positions. The Group Action Project, customized and designed to cultivate civic action through an analysis of a critical issue facing Erie County, will address the feasibility of a tunnel to connect Presque Isle to Erie's east side through a partnership with Presque Isle leadership's new Master Planning Project. As the ECCL program concludes Oct. 6, participants will receive their graduate certificate and present the Group Action Project's findings to an audience of employers, local officials, and media teams. For up-and-coming community leaders, this could be the opportunity to make real change. Think of it as something a bit bigger than just a handshaking opportunity. Thomas Jefferson once said, "Do you want to know who you are? Don't ask. Act! Action will delineate and define you." Well, Reader readers, here is your chance to act, to define yourself as a leader in Erie County. Applications, which will be accepted until the end of March, are currently available online at JESErie.org, and will be available at Thursday's open house. Tuition is $1,500, which covers the overnight retreat, hotel accommodations, and luncheons. Scholarships are available, and organizations are eligible to sponsor participants. Interviews will be conducted through the first week of April, and successful applicants will begin getting notified April 7. Chris Sexauer can be contacted at cSexauer@ErieReader.com.